Whew! This card didn't come together easily...at all. Yes, they call them challenges for a reason. Banners are so cute. And, probably easy. For someone else. It took me soooo long to come with banners that looked right on this card. Oh well...moving on! Take a look at the 2 challenges I've combined for my card. Two great challenges, huh? You can click on the links, above, to see all the details on both sketches. I very seldom make a card that isn't rectangular or square. So this was a little bit out of my comfort zone. That's ok...I do enjoy a challenge...or two! It's difficult to see, but I used a stardust glitter pen, randomly, on some of the lines of the stamped flowers. Then, on the 3 banners, too. It's a rainy, cloudy day so my photos aren't as bright as I would like. My friend Linda came over to stamp with me today, so I had a little help with ideas for this card! She even gave me that piece of glittery pearls that the banners are "hanging" from. Don't you love stamping with friends? To see a larger view of any photo, just click on it. Thanks so much for taking a look at my card today! I hope you'll leave a comment. very pretty! I love those flowers too. Good luck! just perfect,simple and effective to look at but probably took ages to make.. Very pretty and great use of this week's colors. Thanks for joining us at The Play Date Cafe. Totally gorgeous!! I would never have guessed this is out of your comfort zone! Beautiful! gorgeous! 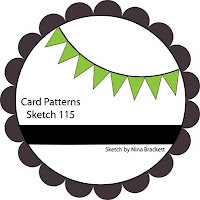 Thanks for joining us at Card Patterns! Gorgeous Susie! Love that ruffled ribbon treatment and that delightful banner! Thanks for playing along with us at the Play Date Cafe! I love your card, especially the flowers in the background with the sentiment over the top, it looks really lovely. That ruffled ribbon looks fab too! 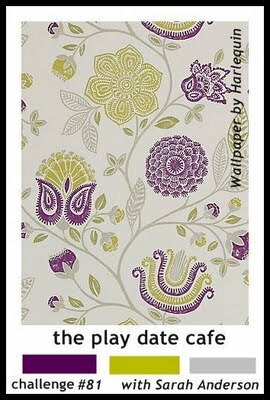 Thanks for playing along with us at the Play Date Cafe this week! Susie, this is such a bold circle card! I like those big scallops around the perimeter. Great use of our colors this week at the Cafe; so glad you were able to play with us! Wow Susie, this is a gorgeous card! Love the big scallops & all the other details you added to your card.